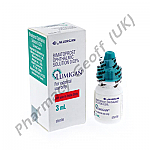 For Glaucoma: Contact lenses must be removed before application. Thoroughly wash you hands prior to use. With one hand open your eyelids and carefully apply one or two drops into your eye. Close and re-open your eye several times to spread the liquid over the surface of the eye. Repeat with your other eye if necessary. 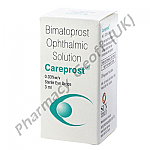 For Eyelashes: Wash hands thoroughly before applying Bimatoprost. 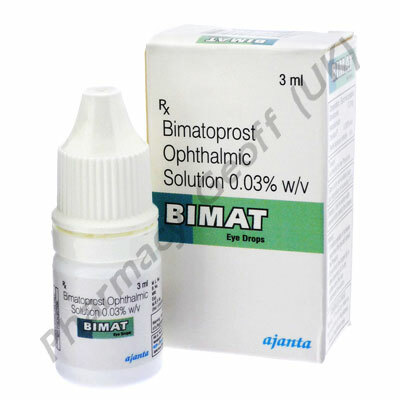 You will need bimatoprost applicator brushes to apply the drops to the eyelid. Carefully drop one or two drop onto the brush-end of the applicator. Run the applicator away from the eye along the length of the lashes. Each applicator should be used only once to avoid contamination, so discard this first applicator and repeat with a second applicator on your other eye. As with most eye drops, you may feel some irritation of the eye including a burning or stinging sensation, redness, dryness or watery eyes. In some cases you may develop discolouration of the iris and hypersensitivity to light. If any of these symptoms become troublesome or continue to worsen with use you should contact your doctor. If you suffer any vision changes, pain in the eye, swollen eyelids or red eyelids this may be a sign of an allergic reaction and you should seek medical advice. 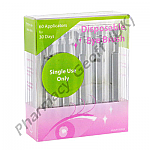 We also carry Bimatoprost Applicator Brushes designed especially for applying bimatoprost to eyelashes. These come in a pack of 60 brushes, so allow you to apply bimatoprost to each eye for 30 days.